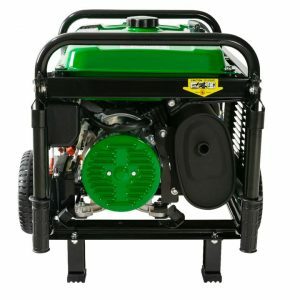 Is A Dual-Fuel Generator Worth Buying? The DuroMax XP4850EH is a powerful 4850 watt Dual Fuel hybrid generator and because of this quality, it is very hard to debate its efficiency in providing power at home or at work compared to other generators. It is made specifically for better performance and longer life thanks to its cast iron sleeves in the engines. Just as the name suggests, this dual fuel generator can run on either liquid propane or gasoline and yes, fuel efficiency is one of its many advantages. Since the aim of getting a new generator is to get top quality, DuroPower manufacturers understand perfectly the importance of high-quality electricity as well as the importance of giving real value to their customers which is why they made such a special generator. The DuroMax XP4850EH is a top quality choice for generator users around the globe. The manufacturers built this machine for the purpose of a longer lifespan with the capability to work very hard which makes its efficiency level unquestionably of good performance and versatile for demanding conditions and times where gasoline my be hard to come by. The DuroMax XP4850EH is one of the best small generators money can buy for home owners and so doesn’t require much scouting around for durable and efficient generators. Their generators are not always the most advanced unlike most modern generators but one thing that is convincing enough is that you’re paying for an affordable generator that is built to be as tough as it comes. It was designed for durability and the manufacturers cared less about increasing the price by adding more technology just for profit sake – it’s a basic, safe and reliable generator which is what every consumer needs. The DuroMax XP4850EH is a very strong machine and the price is not almost worth its level of quality. As anyone building high quality generator will do, the generator is built with high quality materials to serve its purpose. There is much commitment to quality in the machine’s design and as we all know, anything that offers much quality is worth having no matter the costs. With a very promising run-time, using the DuroMax XP4850EH is a very effortless process when one gets accustomed with its control panels. It starts very easily and is guaranteed not to damage any equipment in case of a spike in voltage. The benefits are endless and if you’re looking for a reasonably compact generator to power your home and your essential appliances, the DuroMax XP4850EH is one of the best and you have the added advantage of the hybrid dual fuel generator alongside its many features. 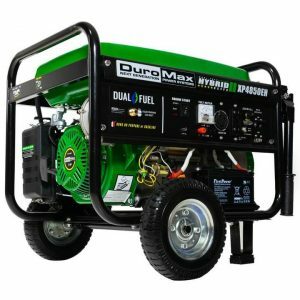 The DuroMax XP4850EH dual-fuel hybrid generator can either run on liquid propane or gasoline. Just in case you don’t know what liquid propane is, it is a fuel in liquid form at or below its boiling point of 44 degrees Fahrenheit which when stored under pressure turns into vapor or gas. Liquid propane creates fewer emissions and causes lesser or no harm to the environment. 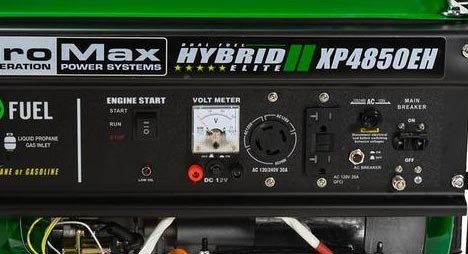 The DuroMax XP4850EH generator has an electric and a recoil start system which gives you the choice to either press a start button or pull the starter rope. If you don’t have the stamina to pull the rope, there is a button to press. Now, doesn’t that make life much easier and less stressful? It definitely does. Another feature of this model is its use of a heavy duty frame with 4 point rubber mounts for the motor in other to enable a quieter and smoother operation. It has a full power panel with an advance warning light, key start switch, volt meter & circuit breaker. The Duromax XP4850EH has a 7HP engine with cast iron sleeves which enables the production of 3850 watts. It comes with a wheel kit which has front handles to aid easy movement. The gasoline fuel tank has a capacity of 4 gallons that can run for eight hours at 50% load capacity. The dual generator has a 12volt DC outlet which allows you to charge batteries. The model has a one year factory warranty. It is approved by the Environmental Protection Agency (EPA) which means it can be used in all states. The DuroMax XP4850EH is not your regular portable generator. When you talk about quality, durability and a great performance, you’re talking about the DuroMax XP4850EH generator. DuroMax seeks to give only the best to their customers putting into consideration the price. Their generators are very affordable compared to other brands. The Duromax XP4850EH model typically runs on gasoline or propane and can be used anywhere on or off your property thanks to its portability and the kind of fuel it uses. It offers two different ways to start, the electric and recoil starting. 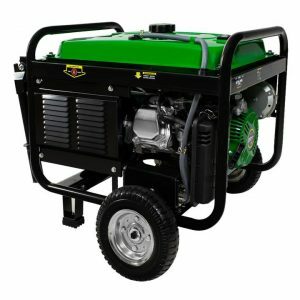 This generator is highly useful for an emergency condition when gasoline may be hard to get as well as other demanding or critical conditions. In addition, Duromax XP4850EH is EPA certified, making it safe to use by reducing air pollution and protecting public health. Its engine is built in iron sleeves for durability. The model is mainly built for basic needs, hence its lesser price. Unnecessary technologies found in other brands of generators which customers may not need are absent in Duromax XP4850EH. The Duromax XP4850EHis built in a rugged design which guarantees its durability as well as an excellent performance. It has a hybrid engine (runs on gasoline & propane) which uses a 210cc 7HP4-stroke, CHN engine with cast iron sleeve. 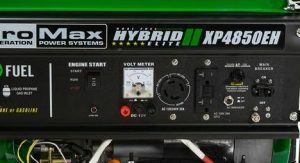 However, Duromax XP4850EH dual-fuel hybrid generator is not CARB certified making it unavailable in California but it is however EPA certified as stated earlier. DuroMax XP4850EH generator has a very large muffler with a spark arrestor used in an exhaust system to help minimize sound transmissions caused by exhaust gases while operating the generator. The muffler is really quiet compared to standard generators which are more expensive. Although it does not have an extra sound insulation, the muffler is quite effective. While you’ll have to raise your voice to be heard by another person when you are near the generator, you can still converse normally if you are at a short distance away from the running generator. So, its sound is very much bearable unlike other generators. The Duromax XP4850EH has an alternator that produces 3850 running watts and a starting watt of 4850. This amount of power is ideal for most standard RVs as it will also give enough amps to run some if not most household appliances. Not only that, it has an automatic voltage regulator (AVR) which protects your electrical appliances from damages that may be caused by a spike in the voltage. You can be assured of smooth running when you use an air conditioner or a large or small refrigerator. Duromax XP4850EH has its alternator designed in metal to ensure durability and avoid deformation. The Duromax XP4850EH has a low oil indicator which is located below the key ignition control on the far left of the control panel. It also has low oil shut off that automatically stops the engine when the lubricant level is too low. The model has an oil capacity of 20 fluid ounces so you should probably get a can of SAE 10W before taking it for a test run. As said earlier, this generator has a dual-fuel capacity. You can fill the 4 gallon fuel tank with either gasoline or propane which can easily be stored for future use. Storing propane for future and emergency occurrences saves time and prepares you against any kind of power outage. Propane is the ideal fuel for emergency purposes. This model doesn’t disappoint as a true back up power source. When operated, it produces about twenty hours of bright light because the natural gas burns slowly. However, it should be noted that Duromax XP4850EH generator run-times are based on typical power loading scenarios. In a world where natural disasters or emergencies can cause power outage, it has become highly important to create and purchase generators with an easy-to-interpret control panel. Not everybody will know how to operate a generator using the control panel properly. In fact, most people don’t. Hence, the reason for an easily interpreted control panel. The Duromax XP4850EH model has a control panel that can be easily read and interpreted. The control panel has an analog Voltmeter which displays the current output. The switches and gauges on the control panel are grouped for functionality to ensure friendly and safe use by minimizing the possibility of accidental selection of the wrong control. By the left of the meter, there’s a large-print writing which explains the dual-fuel feature. The electric key start control is further to the left side of the meter. On the far right side, the plugs and electrical distribution are situated. There is a chunky circuit breaker that protects the output section. Furthermore, there are two 120-volts, 20 amp sockets on top of each other. The hybrid generator has three-pronged outlets. There’s a 120-volt/240-volt twist lock outlet which is further down the right side of the meter. The outlet is on call for heavier equipment and it supplies 30-amps of quietly potent power. DuroMax understands the importance of a simple switch at the control panel, so all possible cause for alarm has been eradicated. Considering the fact that the Duromax XP4850EH is built with solid, durable materials, it is surprisingly lightweight at just 142lbs, making it very portable. It has robust wheels and two fold-down handles for easy movement. Duromax XP4850EH rests on solid rubber feet along with thick rubber wheels that help reduce the vibration levels when running the generator. It has overall dimensions of 23.2x17x17 inches and it weighs 142lbs, making it compact in size. Honda EU2200i and Yamaha EF2000isv2 is the models known as a very quiet generators but they are very expensive. DuroMax on the other hand is fast rising to the ranks of the aforementioned brands. The Duromax XP4850EH is designed to create less noise. It runs comparatively quietly, producing only 69dB of sound which puts it a few dB below larger generators. Although, when near the running generator, you’ll have to raise your voice a tad louder to be heard but if you stand a few feet away from it, then you can speak at normal conversation levels like you would anywhere else. The Duromax XP4850EH has an oversized muffler which mutes noise from the exhaust. There is a built-in spark arrestor on the muffler which ensures the safe operation and performance of the engine event in a dried forest area. The spark arrestor prevents combustion flashes from escaping the powerful air-cooled OHV engine. In other words, the generator is built to prevent the start of a wildlife that may endanger lives or even cause deaths. There is no cause to worry should you want to operate the device during extremely dry summer months. DuroMax XP4850EH dual-fuel hybrid generator got you covered. Although the DuroMax XP4850EH generator has a tough tubular steel chassis to physically protect the entire generator’s components, it still has a warranty that backs up the physical shield by providing certain documented assurances. Duromax XP4850EH has a 30 day replacement warranty and a one year warranty for all parts as well as defective workmanship. While this is no doubt a great deal, it’s no guarantee against improper usage of the generator. Read the manual for its proper maintenance and care for it appropriately. All parts that are defective will be replaced without any cost during the warranty period. Ensure that the Duromax XP4850EH is not usually operated only on liquid propane as the seals inside the engine can become dry and brittle. Try to fill the generator up with gasoline at least once in a month. One very important thing to consider when you want to buy a generator is the manufacturer. Yes, those who make it. You want to be assured of its operating capacity, its durability and warranty before taking that final step. Some people have fallen prey to buying unreliable generators due to low quality regardless of how popular the brand name may be. It’s not enough that a brand has a strong popularity; the brand must be a credible one and produce quality. So, it’s important that you properly research the brand you are considering before making a purchase so as to avoid regrets later on. There are lots of manufacturers out there known to outsource parts or the entire units to other countries so as to cut costs. You have to know who make the generator you want to buy because the true maker of the product has a significant impact on the overall reliability, quality and durability of the generator. All DuroMax generators are manufactured by a company named DuroPower. The company specializes in making engines as well as generators designed for both residential and commercial buildings. The company has many models under the DuroMax brand. One of their many generators is the Duromax XP4850EH dual-fuel model. Some sources confirmed that DuroPower makes their own engine to ensure the quality of the products they manufacture. Unlike standard generators, dual-fuel generators cost quite a bit more which may make a buyer wonder if it’s actually worth it. Since a dual-fuel generator makes use of propane, it automatically gives a great advantage over standard generators. Propane is a cleaner burning fuel which is safe for environmental use. It doesn’t emit fumes from a gas can and its tank doesn’t leak nor spill during transportation. There’s less carbon buildup inside the engine components and the oil doesn’t get diluted when using gas because propane is good for the engine. With this, the engine functions better and lasts longer. When running a propane generator, the output wattage will be around 10% less than when gas is being used. However, it is recommended that you run the Duromax XP4850EH on gas monthly if you make use of it daily. Propane shouldn’t be used all the time so as to stop the fuel seals from getting dry and brittle. Looking for the best dual fuel generator that suits your need, causes little or no damage to the environment and costs relatively less can be so hard considering the many available options. We understand this, and that’s exactly why we created this review – to give you the insight you need. You need a compact portable generator that will give you enough power to serve as a reliable backup, running most of your essential appliances, during a storm or power outage; something that’s perfect for your RV. The Duromax XP4850EH dual-fuel hybrid generator has a one year warranty as stated on the DuroMax website. It offers two-way starting, durability, portability, great power output and easy maintenance. The DuroMax XP4850EH ticks all the boxes.